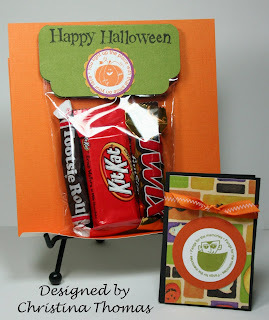 Here are 2 treat bags that I'm working on. The blessing bag is for my nieces and nephews. You can fit a fun size candy bar in it with a few dollars. The larger bag is for my son's 1st grade class. I made the topper from the Fabulous Finds Cartridge from Cricut. The stamp is the Stampin' Up's "Batty for You" stamp set (item # 109363). I love these little guys.